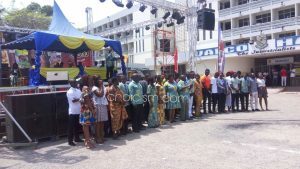 The Valco Hall of the University of Cape Coast have emerged as winners of the 19th Inter-halls Cross Country competition held at the Casford field, UCC. 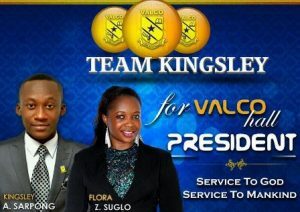 Valco also known as the Industrialists placed first in both the Male and Female Divisions of the competition with twenty five (25) points and twenty six (26) points respectively. Kwame Nkrumah Hall came second with eighty (80) and twenty seven (27) points in the Male and Female categories. Oguaa Hall also placed third in both categories with Adehye and Casford Halls placing forth. Atlantic Hall (The Mariners) couldn’t make up the required number of qualified participants to score any point. With the individual wins, Ramatu Issifu (Valco Hall), Helena Denzel (Valco Hall) and Mariam Domfeh (Oguaa Hall) placed first, second and third respectively in the female category. In the male category, Emmanuel Duah (Valco Hall) came first, Ayikamby Francis (Atlantic Hall) came second and Baba Tia (Atlantic Hall) came third. The winners each received cash prizes from the University. Presenting two trophies to the winning Hall, the Dean of Students, Dr. Kwao Edjah, congratulated the Sports Section of the University of Cape Coast for such great innovations.